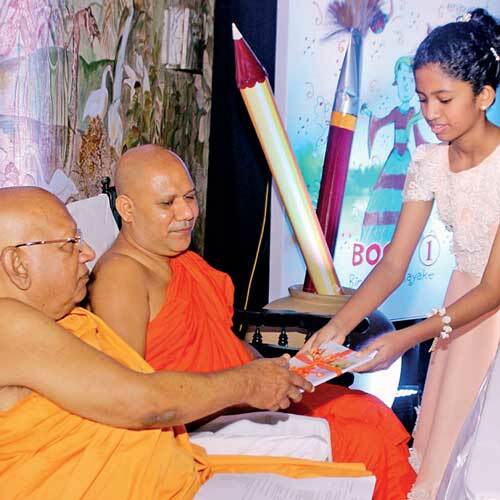 ‘Amelia and the Ring of Enjoyment’, a fantasy fairy-tale book written by an 11-year-old girl named Binadie Ratnayake was launched recently at the Bellanwila Temple. She is a student of Lyceum International School Nugegoda. The chief guest for the memorable occasion was Ven. Prof. Bellanwila Wimalaratana Thero, Deputy Chief Incumbent and Chancellor of University of Sri Jayawardenapura. Prof. Senavi Epitawatta, Former Vice Chancellor of University of Sri Jayawardenapura, Dr. W.A Abeysinghe, Chairman National Library and Documentation Service and Kumari Grero, Principal of Lyceum International School Nugegoda, were also present amongst the distinguished gathering. The book is about a young girl named Amelia Jennifer who discovers a land called Enchantia and helps fairies and other magical folks to fight evil with goodness. Binadie had begun to develop her language and writing skills since her early childhood and she also wrote simple poems on walls and later on paper. She had also improved her speaking ability by relating short and easy stories you could never stop listening to and she’d even written them down as little memories. Amelia and the Ring of Enjoyment is the first book of a series of five books. She has already completed writing three books of the series of five which will be published in future. The guests who addressed the gathering were highly impressed about her skills and talent in writing and creativity. They highlighted the value of writing books and gave further advice to improve her skills in future. Many made wonderful remarks after witnessing the program, and everyone highly praised the young author.